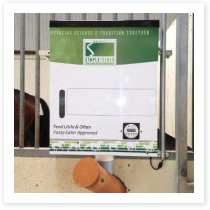 SiMPLEFEEDER is an exceptional cost effective aid for the digestive system of your horse, improving the animal’s welfare through the management of its feed intake & optimising the digestibility of the feed so that the horse now gains its full nutritional value. This in turn allows owners to spend more value added time with their horses. The concept behind SiMPLEFEEDER is to provide each horse a feeding regime which would replicate as close as possible its natural feeding environment. With SiMPLEFEEDER the horse has a greater number of daily feed times, each containing a smaller quantity of feed, than previously. This enables trainers, breeders and owners to more closely mimic a horse’s natural grazing behaviour, allowing owners to tend to their horses as & when they require – saving time & money. • Early feed times ensure that when you arrive at the stable, your horse has digested its feed & is ready to be exercised.